Recently, 3TP LLC of Southampton, NY, introduced new computer technology designed to be used with high-resolution contrast-enhanced magnetic resonance (MR) imaging to help clinicians determine if specific tissue is benign or malignant. Using proprietary algorithms on physiologic properties of tissue enhancement, the "3TP Method" creates a color-coded map indicating whether areas are malignant, benign, or indeterminate (Figure). "The basic aspects of our method are the way we analyze dynamic contrast-enhanced MRI," explained developer Hadasa Degani, PhD, Professor and Chairman, Department of Biological Regulation, the Weizmann Institute of Science, Rehovot, Israel. When contrast media is injected into a patient, a dynamic process takes place, she explained, and this process is the same regardless of the modality used to monitor the effects. "Initially," Degani said, "when you inject contrast media, you have a very high concentration in the blood. Eventually, it leaks out to many places in the body, including the kidneys and urine, and the concentration in the blood decreases. In the meantime, some tissues, particularly cancers because they have very few vessels, will accumulate contrast media up to a certain level until it is nearly equal to the level in the blood. It will then go back into the blood and eventually clear from the body entirely." This dynamic behavior is generally predictable by mathematical equations, based on the type of tissue (eg, malignant tumor versus normal tissue, etc.). These wash-in/wash-out characteristics of enhancement comprise the first principle behind the 3TP Method. "The first parameter, the permeability in the surface area of the blood vessels, is intuitively very simple: If you have more blood vessels, then you have more permeability and things will move faster from the blood to the tissue and back," she said. The second principle behind this system is based on the extracellular or interstitial volume. "To some extent, if the contrast agent reaches only the extracellular volume (the interstitial volume around the cell), then the amount of the interstitial volume will also dictate the dynamics," said Degani. "If there is a lot of volume, it will take a long time to fill it up, and once you do, it will be very pronounced with a lot of contrast. If you have a little space, then it will reach equilibrium with the blood very quickly, and it will wash out from the tissue very quickly." The second principle is less intuitively easy to understand, but it is an important independent factor. It tells you how the cells are packed. If you have many cells, then the interstitial volume is very small. "It is not as well related to the vascular system, but is rather related to the structure and growth of tissue," Degani explained. Although different cancers will have different properties, there are some common characteristics. "In general, all cancers, not only breast cancer, have high permeability and high blood-vessel surface area because of their growth and biology," noted Degani. "Generally, they are also very heterogeneous and show regions with lots of cells and regions with few cells." In order for the clinician to observe all these properties, however, very high resolution imaging is needed. "In MRI, it is very difficult to get both high temporal and high spatial resolution," Degani said. Her research showed, however, that by taking measurements at just three time points, the physician would be able to gather the necessary data. "If you monitor at the right three time points that you chose a priori, then you can extract this information and maintain very high resolution because you have time between the time points," she explained. "Three time points are enough to give you information about distal parameters that enable you to differentiate between cancerous and benign tumors of the breast." "Not just any three time points will give you the results you are looking for, however," she noted. "You need to know which time points to choose; that is what we determined." Contrast-enhanced images are taken at three time points within a 7-minute scan. The first time point is immediately prior to the injection of the contrast media, the other two are carefully chosen after the injection of contrast media. A "wash-in:wash-out" ratio and a color-coded calibration map are established. "We color-coded the results so that the analysis will immediately reveal where there is cancer and where it is benign," continued Degani. "Essentially, we solve how to choose the three time points and how to standardize the methods so users can work with different contrast agents or different modalities." The system works regardless of contrast agent or imaging modality because it is based on physiological parameters, and these parameters for patients with breast cancer are always within the same range. To date, this method is approved in the United States for use with MR imaging of the breast and the prostate. "We developed this primarily for breast cancer and performed many clinical trials in the breast," stated Degani. "We may need a little more experience with the prostate; but, in certain areas of the prostate, particularly in the peripheral zone of the prostate and for staging of prostate cancer, it is very clear." "The sensitivity of MRI is by far much higher than any other modality and it picks up many more lesions than mammography, but most of them are benign," she explained. "If we use MRI for breast cancer without high specificity, the incidence of unnecessary biopsy will be too high. This method offers a method with very high sensitivity and specificity." "This method can be used with MRI and with other methods that use intravenous contrast, such as CT and ultrasound," she concluded. "For CT, I think it's even more important to use this method because CT offers high temporal and spatial resolution, but you can't expose the patient to radiation too many times. So determining the minimum scanning time to get the maximum information is essential." Degani also noted that they have developed a method for using this system with CT for the detection of lung cancer. "We use the same principles with CT. It works, but it's very preliminary and we haven't published it yet," she said. Siemens AG (Munich, Germany) will be showcasing the company's new Tim (Total imaging matrix) MRI technology on its new 1.5T MR system, the Magnetom Avanto, at the European Congress of Radiology (ECR 2004) in Vienna, Austria, March 5-9. This new technology allows whole-body imaging to be completed within 12 minutes without the need to change coils or reposition the patient. The basis of Tim is a proprietary matrix coil design that allows for a combination of 76 coil elements with up to 32 radiofrequency channels. This technology provides a scanning area up to 205 cm, enabling whole-body scanning of a patient up to 6′ 9″ tall in a single examination. The coil, called the Body Matrix coil, weighs <2 lbs. In addition, with Tim and the Magnetom Avanto system, the patient can be scanned feet first, allowing the patient's head to remain outside the scanner for many procedures. The system also uses AudioComfort noise suppression that reportedly reduces conventional noise levels up to 97%. The new system is based on the company's syngo platform, which also features the company's iPAT (integrated Parallel Acquisition Technique) that allows for fast image acquisition and parallel imaging in all directions across the body without the need for the specific PAT coils. The user is able to select clinically relevant areas-from individual body regions to the complete anatomy-without limitations on the number of coils that can be connected and used simultaneously. "Tim enables us to set aside all previous levels of intricateness," said Claus D. Claussen, MD, director of the Diagnostic Radiology Department at the University Hospital Tübingen and Chairman of Radiology at Eberhard-Karls-University, Tübingen, Germany. 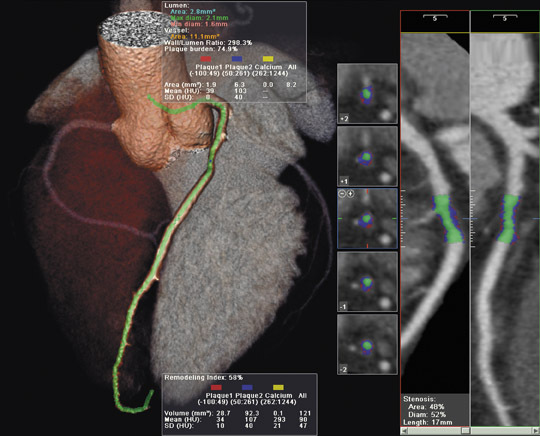 "As a result, the clinical workflow is greatly improved, enabling a far better patient throughput and excellent image resolution and, thus, optimal image quality." Tim is now a standard feature on the Magnetom Avanto and is available as an upgrade on the company's Magnetom Symphony, Sonata, and Trio lines. Technology and Industry: A color-coding method for breast MRI; Siemens to introduce Tim at ECR 2004. Appl Radiol.